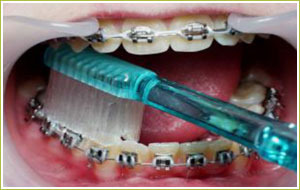 Tooth brushing is a very important part of having braces. 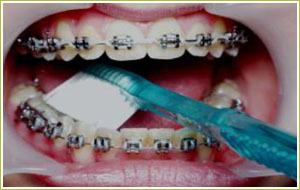 It is vital that you keep your teeth, gums and braces very clean, to avoid permanently damaging your teeth and gums. Damage can vary from tooth decay to puffy, bleeding gums or permanent white marks on the teeth. These all occur from not brushing properly or consuming too many of the wrong foods and drinks. 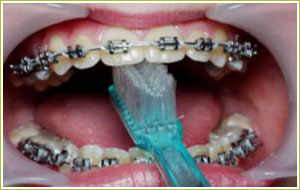 Brushing will take longer once your braces are fitted: approximately six minutes, after every meal and after snacks. You will need to use two different toothbrushes to effectively clean your teeth. 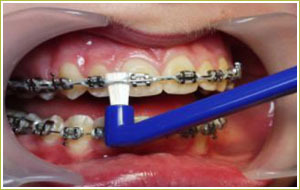 We will give you these two brushes when placing your braces and demonstrate how to use them. 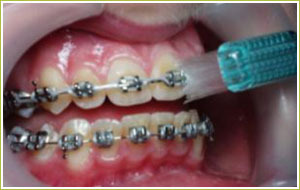 It is important to continue regular dental check-ups with your own dentist while undergoing orthodontic treatment. Remember – clean teeth will move more quickly. 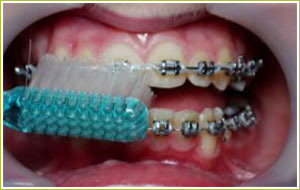 Place the toothbrush directly on top of the brace. Using a circular motion brush for 10 seconds on each tooth. It is easier to have a routine, for example, start on the upper right side of your mouth and work around. 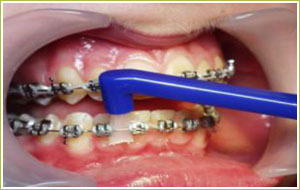 Place the toothbrush at a 45-degree angle above the brace so the toothbrush bristles are able to clean on top of each bracket, and very importantly clean the gum-line. Again using a circular motion count to 10 seconds on each tooth. Place the toothbrush at a 45-degree angle under the brackets, towards the biting surface of each tooth. Clean in circles, 10 seconds on each tooth. Scrub each chewing surface with a back and forth motion for approximately 10 seconds. Cleaning the inside is quite tricky. You need to place the toothbrush at a 45-degree angle towards the gums and use a circular motion, 10 seconds on each tooth. When cleaning the bottom teeth, ensure your tongue is out of the way. When cleaning the front top and bottom teeth on the inside, bring the toothbrush straight up and down out of the mouth. Be careful not to make too much mess on your bathroom mirror! 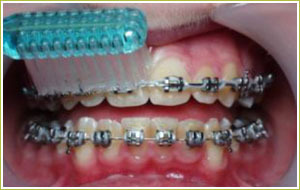 An inter-dental toothbrush will clean under your archwire and in between the brackets. This is very important as plaque and debris can build up and cannot be properly removed without the use of this toothbrush. Use this toothbrush by pointing the bristles towards the gum, place in between the brackets and under the arch wire, move the brush up and down approximately 10 times in between each tooth. 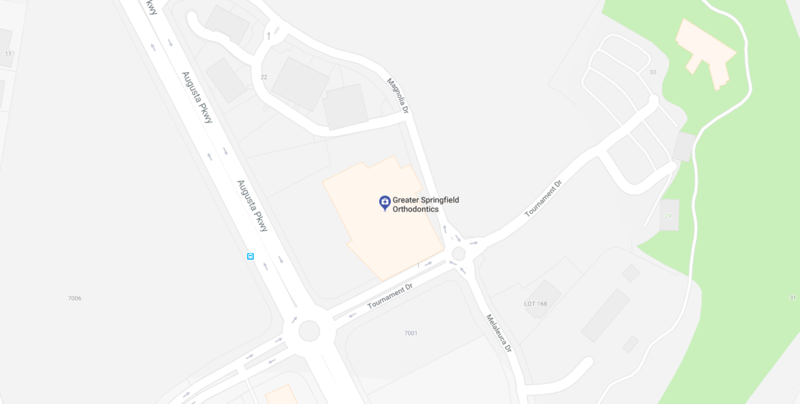 If you need any more information or would like a proper demonstration, please call Greater Springfield Orthodontics to schedule an appointment. Our specialist orthodontists will be happy to guide you through the process and give you any pointers.